The advent of GPS has substantially increased the demand for local geoid determination. The local geoid is needed to convert the very accurate geometric co-ordinates provided by GPS to physically meaningful co-ordinates required for many applications. In order words local geoid determination is vital for most GPS users to fully exploit its tremendous and ever increasing potential. There are various methods for determining the local geoid. However these existing methods are either insufficiently accurate, inefficient slow and expensive. Theoretically, astronomical levelling is probably the most accurate and computationally simple solution to the problem of local geoid determination. The idea here is to determine astronomic co-ordinates, and compare to geodetic co-ordinates now obtained from GPS. The difference gives deflection of the vertical which can subsequently be used for precise or local geoid determination. However this method has never been of any practical importance. This is mainly due to the fact that the conventional methods of determining astronomical co-ordinates, besides other reasons, are time consuming both in the field and in the office, insufficiently accurate, very costly and old fashioned and therefore not compatible with GPS. With the efficiency of GPS positioning and developments in computer aided astrometry based on high performance CCD cameras, a new, fast, fully digital and solid-state technology is now available to reconsider astronomical levelling. 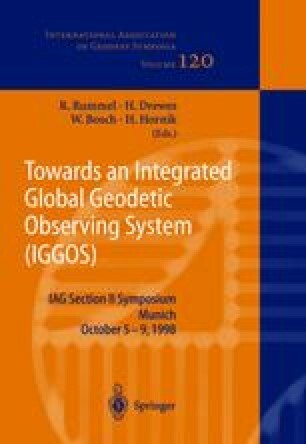 This paper reports on research work going on in IfEN which is aimed at developing a system for full digital observation of the direction of the plumb line, a digital data transfer and numerical determination of the deflection of the vertical and local geoid by combination of CCD technology, differential GPS, GPS based time distribution and computer technology. Preliminary results indicate that an accuracy of the order of 0.3 arcsec or better in the astronomic values, required for “cm” level geoid determination, can be obtained.